Camilla McGuire Remembers | SoHo Memory Project. This is a guest post that was submitted by a reader I had never met before. Here name is Camilla McGuire, known as Cammy to her friends, and she has lived down the street from me for thirty years! 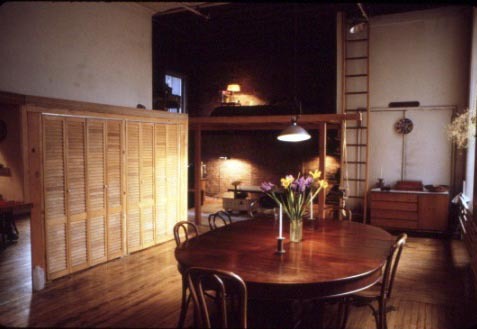 I finally got to meet Cammy, who is now 86 years old, at her loft, which still retains traces of the old days—a toilet from the stone age and an elevator cab that took me back to my childhood. We are now friends, and we share the bond of place, one that I am learning is quite powerful and enduring. 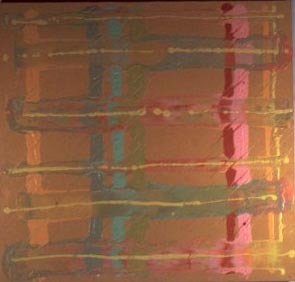 I was an art teacher living on Long Island in 1969 and studying for my Masters Degree in art education. SoHo was of course a strong attraction for me, and I came into the city as often as possible to tour the galleries that were cropping up all over and to get acquainted with what seemed to me the most exciting neighborhood ever! I made it happen and moved to SoHo with my son in 1971. My earliest memories of SoHo are of broken sidewalks ankle-deep with industrial trash, and though it was dirty and often smelly (this was prior to the pooper-scooper law), there is no doubt in my mind that it spawned a lot of art (Louise Nevelson comes to mind as a primary example of art created or inspired initially from discards from a near-by furniture factory). There were also things like leather pelts with soles cut out from a nearby shoe factory, wooden spools with colorful threads, and bales of colorfully patterned fabric scraps all bundled together. 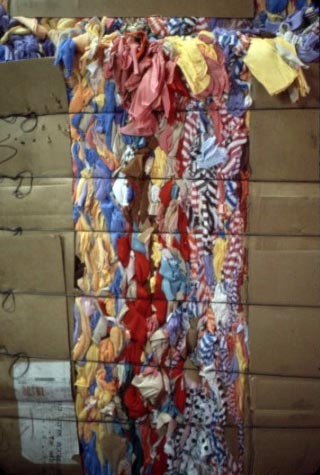 These bales were then loaded on open trucks and shipped elsewhere, creating a parade of traveling abstract, if accidental, art the streets of SoHo. There were also marvelous solid-wood hat blocks from a nearby hat factory that provided ready-made modern sculptures from variously shaped hat crowns! And there was a wonderful doll factory on Greene Street that used to toss out oddly shaped swirls and slabs of flesh-colored plastic residue that looked like they came out of a large Tastee-Freeze machine. What great stuff! I regret that I didn’t collect more scraps. My hat block unfortunately was stolen, and the flesh blob I picked up was given away to a friend. Another fond memory is of Zelf’s Industrial Machine Rental, also on Greene Street between Grand and Broome. Zelf (whose first name I don’t recall) ran the store with his faithful wife, “Chickadee,” behind the counter. They were an elderly couple who both evidently were absorbed with the importance of hair— Chicadee had artificially flaming red hair which she wore piled on top of her head while her husband wore a very obvious toupee! Since everyone who was renovating their loft had to go to Zelf for floor sanders, grinders and the like, Mr. Zelf always insisted that before you could take a piece of equipment out of the shop, you had to listen to his tutorial- demonstration. He had a very studied, professorial style of delivery and demonstrated sanders on a square of wood flooring in the front of the store. The sweetest thing was that I used to see them on Sunday mornings walking hand in hand like a pair of turtledoves strolling around the neighborhood. I wish they were still here! Another of my fondest memories is of the SoHo that will never return. Gone are the big name dealers, Pace, Sonnabend, Paula Cooper, and the galleries that were on every block. They are mostly all in Chelsea now. Gallery Guide would list all the current exhibits complete with a map of Soho, circling each location. The routine was to meet up with one or two art friends, do the “Soho Run,” see who was showing where, and what was new. There were only three local bars: Fanelli’s at Prince (fifty-cent beers), Spring Street Bar at Spring and West Broadway (Morgenthal Frederics Eyewear now), and that other old-timer, Kenn & Bob’s Broome Street Bar. These destinations were convenient places to stop, evaluate new shows and exchange art talk. It was a weekly event not to be missed. It seemed like SoHo was a cauldron of artists’ ambitions and ideas. The air was full of explorative methods of making art, painting, music, and dance. Anything and everything was possible, and everything was permissible. Most if it was exciting. Occasionally some of it was ho-hum depending on your interpretation I guess, but I thought all of it was interesting. I regret that they took those away and replaced them with chic clothing stores and heavier traffic. Ugh! P.S. I never met Yukie, but I must have seen her from time to time. She would have been a small child, and I was already 46 when I came with my son Timmy who was 9. I thought at the time that Tim was the only kid in Soho. He attended P.S. 41, and his only playmates were in the I.M.Pei buildings on Houston. There were absolutely no baby strollers! 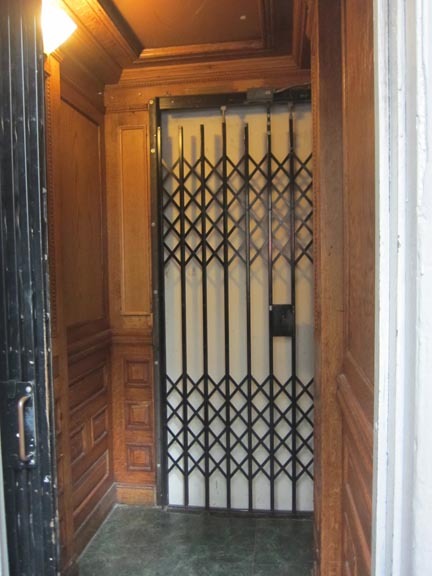 The elevator in Cammy's building, though now automatic, still has the original cab." 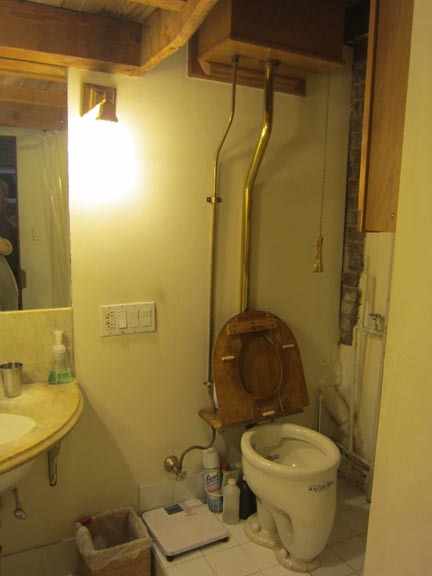 Cammy's toilet is still all original, including the elevated tank with the chain (remember those?)"